Like swimming, rowing is a full-body sport, which explains why it can tire you out in minutes. “Because all major muscle groups are involved—legs, back, glutes, shoulders, arms, and abs—each stroke requires a lot of power, and you run out of oxygen very soon,” says Peter Mansfeld, the high-performance head coach at Vesper Boat Club in Philadelphia. Newcomers to the rowing machine, also called an erg, make two main mistakes. The first: too much weight. There’s an arm on the flywheel called the damper that controls the resistance. A damper set at the heaviest is a sure sign of a novice. “Even for a warmup, you’re putting a lot of strain on your back,” Mansfeld says. Keep the resistance at medium. So begin by powering through the legs. Then, as you start to hinge back, initiate the pull. That whole process should take 1 second, while the reset takes 2 seconds. Even as your stroke gets faster, that ratio should stay. Now you’re ready to cover some distance. Use the erg’s computer, which is preprogrammed for 500-, 1,000-, and 5,000-meter intervals. 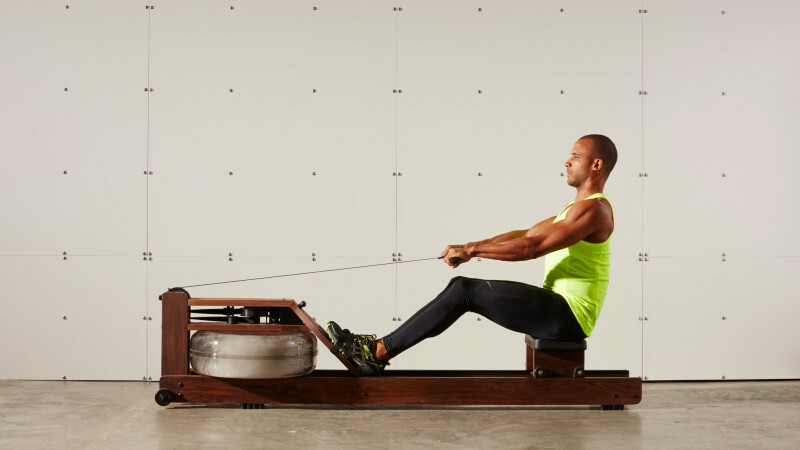 You can treat the rower like a treadmill with tempo runs and intervals. Be warned: Rowing in an erg is like running on a treadmill. It’s a workout, but the fun part about the sport is being outside. Visit a local rowing club, join an adult crew team, and find out what pulling yourself across the water really feels like.